Battle of the Spanish Armada (1588) - It's hard to say if the Battle of the Spanish Armada ranks among the top ten battles of all-time (because there are so many from which to choose); but it certainly ranks among the most significant naval engagements ever, as well as one of the most important in England's history. It saw the decline of one empire and the rise of another. Tensions between Spain and England had been building for about two decades (going back to the skirmish at San Juan de Ulloa), and by the 1580s conflict was inevitable. Spain already had a powerful navy (King Philip called it his "Invincible Armada"), and England had been building hers for years (see John Hawkins above). At the same time England was doing everything possible to delay the coming battle while she prepared. The year before, Queen Elizabeth approved a raid on the port of Cádiz which proved very effective (see Francis Drake above). Nevertheless, the battle was met in 1588. The cause of the conflict was primarily two-fold. First, Spain was a Catholic nation and England was Protestant. Not only that, but Elizabeth's predecessor was her half-sister, Mary, who was Catholic and had been married to King Philip. So from that sense, Philip saw it as his obligation to conquer England, return it to Catholicism and rule as king. And second, English privateers had been harassing Spanish ships for years, stealing treasure and getting rich in the process. Philip wanted to punish England for allowing such action. The Armada launched from Lisbon at the end of May (Portugal was allied with Spain and made up part of Philip's fleet). It consisted of 130 ships, manned with 8,000 sailors and armed with about 2,500 guns. In addition, it carried 18,000 soldiers who would invade the island after England's navy was defeated. Another 30,000 soldiers waited in Spanish Netherlands to be ferried across the channel after the battle. However, because of bad weather the fleet did not arrive off the southwest coast of England until almost two months later. The ships had to dock several times to wait for more favorable winds. At the time, England had a very small standing army which likely would not have been able to resist an invasion. So the English navy was the last line of defense. 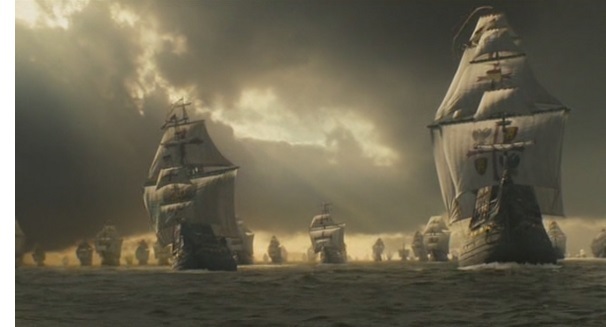 It was actually larger than the Armada at about 200 ships. But they were smaller ships (which turned out to be a positive) and carried fewer guns (about 1,700 total). The Armada was led by Duke Medina Sidonia, a very able commander. In fact, he had recommended that King Philip abandon the invasion for fear that England's navy was too formidable. Philip dismissed the notion. England's command was divided between Lord Howard of Effingham and Francis Drake. Their original strategy was to sail out and meet the armada before it reached the English Channel; but harsh weather foiled that plan, and they decided instead to wait until the last minute and let the sea do as much damage as possible to the Spanish fleet while saving their own from being battered. It turned out to be the right move. By the time the Armada arrived it was already in some trouble. One ship had been lost, another damaged and the fleet had been scattered by the storm so that it was no longer in fighting formation. When it reached the point known as Dodman Head, Medina Sidonia slowed the ships (known as "heave to" in sailing terms) so that they could re-form. Here he assembled a council-of-war to decide the next move. What happened next was crucial to the outcome of the conflict. Had Sidonia opted to attack England's southern port of Plymouth, Spain might have landed the knockout blow immediately. The English navy was divided in two, half in Plymouth under Drake's command and half out in the Channel under Howard's command. They didn't know what Spain was going to do, so they had to split the fleet for either contingent. But Sidonia reasoned that an attack on Plymouth might be fatal. The wind was blowing into port and if it was too heavily defended, escape would have been impossible. He chose to anchor for the evening and wait until daylight, and hope for more favorable winds. But what he did not realize is that the English had built a series of fire beacons running the entire length of the coast (even reaching all the way to London) that could signal the fleet of Spain's position. During the night the divided fleet joined up and took a position windward of the Armada (for those unfamiliar with sailing, this was a tremendous advantage in naval warfare during the Age of Sail). The next morning the first fighting broke out. Spanish hopes for victory lay in close combat so they could board the English ships and commandeer them. The English knew this and used their smaller faster ships to keep their distance. By the end of the day, not much was achieved on either side and the Armada sailed east deeper into the Channel. A second engagement took place off Portland Bill with similar results (not much happening). Medina Sidonia then tried to make for the Isle of Wight which would offer excellent protection to the Armada, but the English managed to cut him off, and he was forced to anchor on the French side of the Channel. The only good thing about this was that the Armada had hoped to hook up with the troops in the Spanish Netherlands waiting for the invasion. However, this never materialized because the Dutch, who had a powerful navy themselves, were allied with England and cut off the Armada's route to the Spanish Netherlands. The Dutch ships were small enough to occupy the shoals of the Channel and the Spanish galleons were too large to enter, protecting the Dutch from attack. Things were now becoming precarious for the Armada. It had traveled the entire length of England's southern coast and was no closer to landing on English soil. It was at this point that Howard and Drake unleashed their "secret weapon". 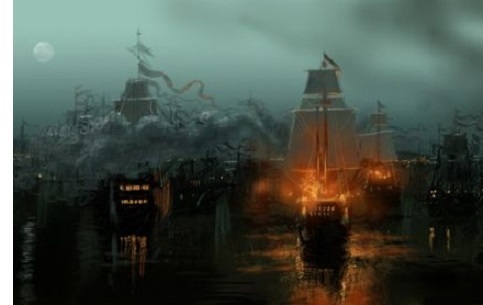 They filled eight ships with pitch and gunpowder, set them on fire and sailed them directly into the Armada. The Spanish captains panicked for fear that the fireships would explode in their midst, so they cut their anchors and scattered. Only one ship was damaged, but the loss of their anchors would become significant later. The nearest friendly port for the Armada was Gravelines near the French border of the Spanish Netherlands. Without anchors it had little choice but to make for Gravelines. With the Spanish fleet limping away, the English decided to move in for the kill. What followed is known as the Battle of Gravelines (a single engagement within the larger overall conflict). Now the British had all the advantages; the faster ships, the wind and a crippled enemy. So they let fly with all they had. The battle started about six miles off the coast of Gravelines and lasted some eight hours. Despite all the problems the Spanish were having, they fought valiantly and did about as well as could be expected under the circumstances. Nonetheless, they suffered casualties. Five ships were lost. It would have been worse but for the fact that a squall whipped up suddenly and forced the English to break off their attack (about the only time in the campaign the weather helped Spain). Little did anyone know at the time that this would be the final engagement between the two countries. Whether it realized it at this point or not, Spain had been defeated. The rest of the campaign became a struggle to survive for the Armada. But it was no longer in danger from its enemy. The English Navy had exhausted its ammunition and its sailors dared not attempt to board the enemy. So it simply turned away and left the Spanish fleet with the arduous task of sailing for home. Of course it blocked the Channel so the Armada could not return via that route. The only choice was to go north round Scotland and turn south along the west coast of Ireland. By now it was September though, and the already rough seas were becoming even more perilous. Also what they did not realize is they were sailing against the Gulf Stream (their countryman, Juan Ponce de León had discovered the Gulf Stream years earlier, but they did not know it flowed that far north). But in order to get out of it, they turned south prematurely and tried to hug the coast of Ireland. It turned out to be a deadly decision. Storms blew many of the ships against the rocks and without their anchors they were unable to take shelter in the foreboding waters. When the campaign had finally come to an end on September 22nd, the Armada had lost half its fleet and about 20,000 men. The English lost only eight ships (the eight that were burned intentionally) and fewer than 100 men. More importantly, Spain never recovered from this devastating defeat and England became the supreme naval power on the planet. Over the next three centuries it used that navy to build the most far-reaching empire in history (the Mongol Empire is the largest contiguous ever, but the British acquired the most land), giving credence to the phrase, "The sun never set on the British Empire".